Chewy understands that you want the only the best for your cat. That's why you'll only see the top brands for cat food, cat treats, cat toys and other cat supplies! If you've been searching for pink cat crates, look no further. Among the wide selection we carry, one option to try is Petmate Compass Fashion Kennel, Pink. Key benefit: 360-degree ventilation & visibility means more comfortable travels for your pet. Another product is Petmate Vari Kennel Portable Dog and Cat Kennel. Key benefit: made in the USA and assembles in minutes with no tools required. Chewy makes it easy to get everything you need for your four-legged family. From cat trees to cat toys, the only thing your cat will love more than the Chewy box is what's inside! 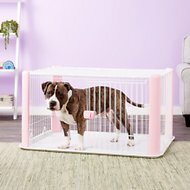 For all your pet needs including pink cat crates, Chewy has you covered! We're here for you.